A single red leaf with shades of yellow on it, lays upon an old tree across the forest floor in Algonquin Provincial Park in Ontario, Canada. Algonquin Provincial Park in Ontario, Canada is one of the most spectacular places to be in the Autumn as colorful leaves fill the forests. A single red leaf with a blend of yellow coloring has delicately danced from the trees above and landed on a tree that lies across the forest floor. 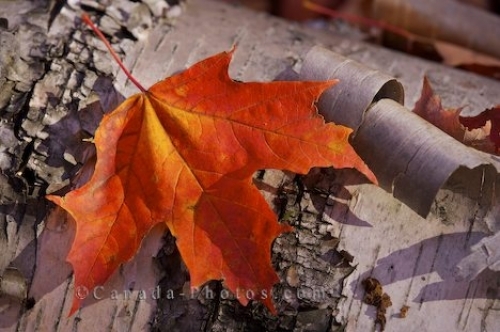 Picture of a red leaf that has dropped from a tree above to rest upon a fallen tree in Algonquin Provincial Park in Ontario.